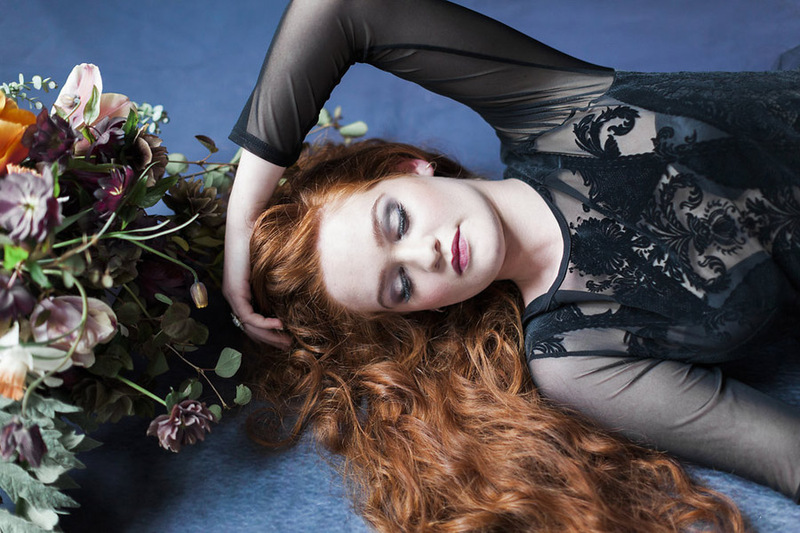 The shoot has already been featured in the beautiful Unveiled magazine – you can still buy previous issues here – so you may well have seen some of these pics in print already. 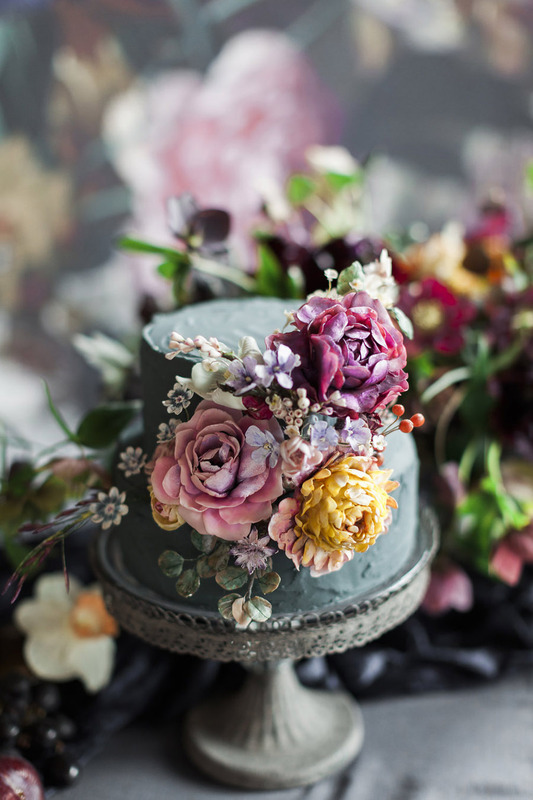 If you haven’t, then this will be a treat for you today! 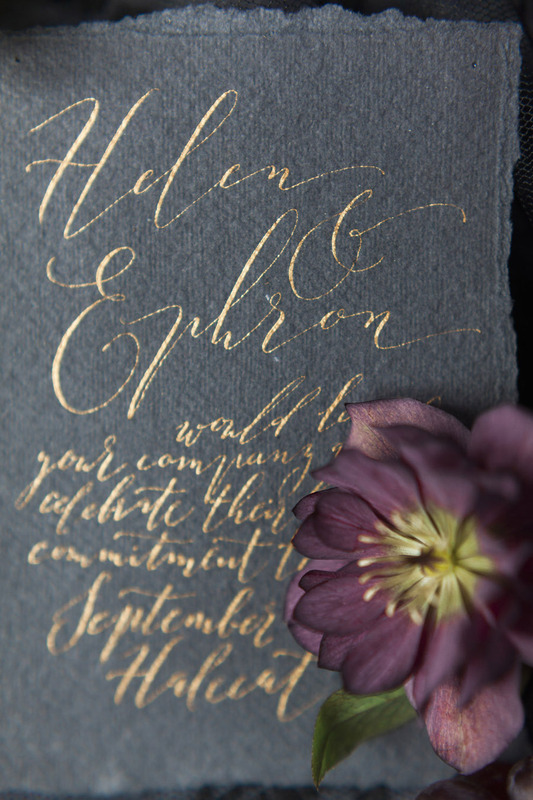 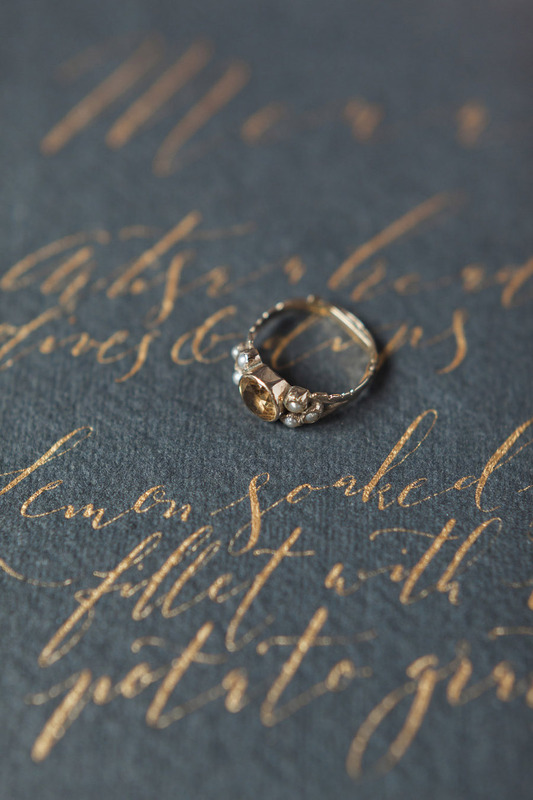 As much as I loved writing the calligraphy pieces (gold ink on black textured papers is my fave!) 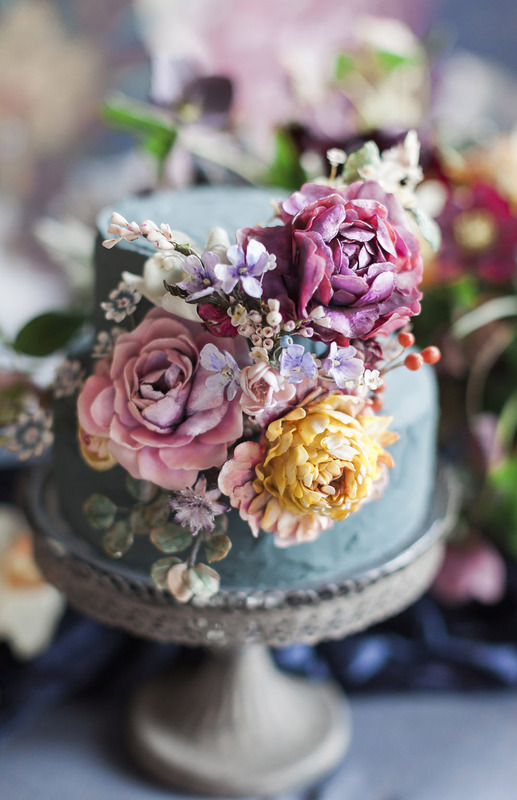 it’s the flowers and cake which steal my heart. 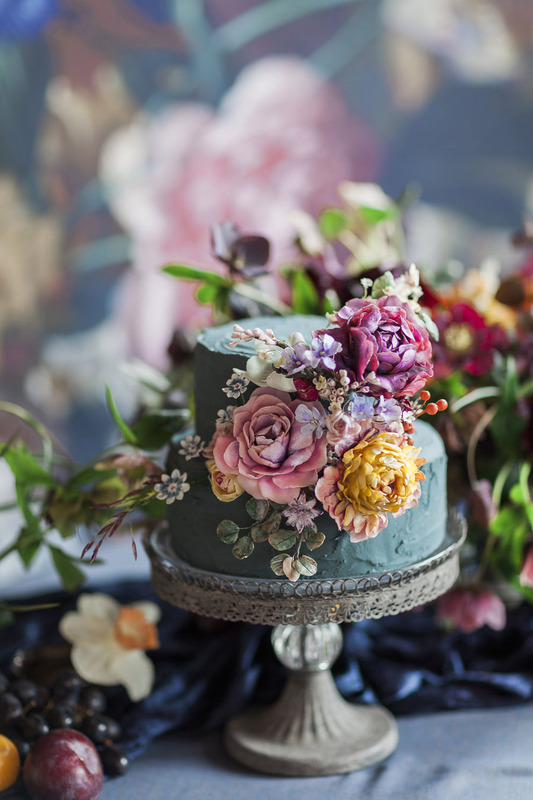 Amy Swann‘s wedding cake creations are works of art in themselves – stunning and colourful creations with the most intricate floral sculptures to captivate and enchant any bride and groom! 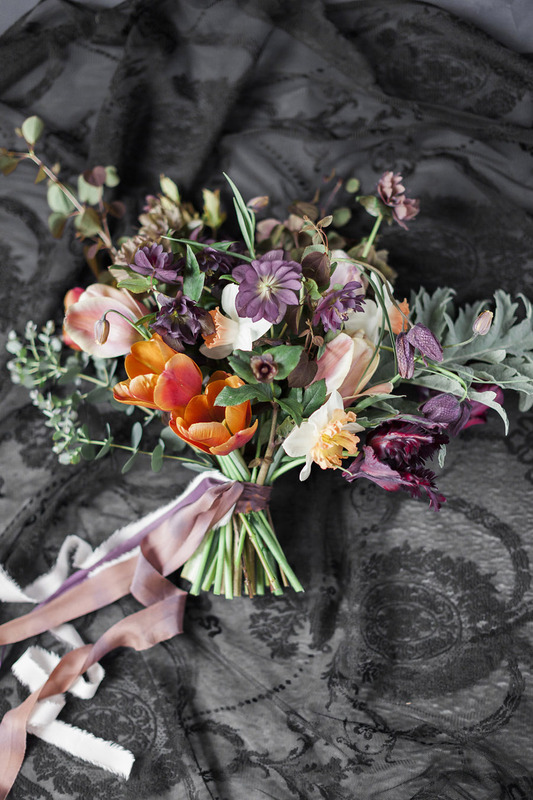 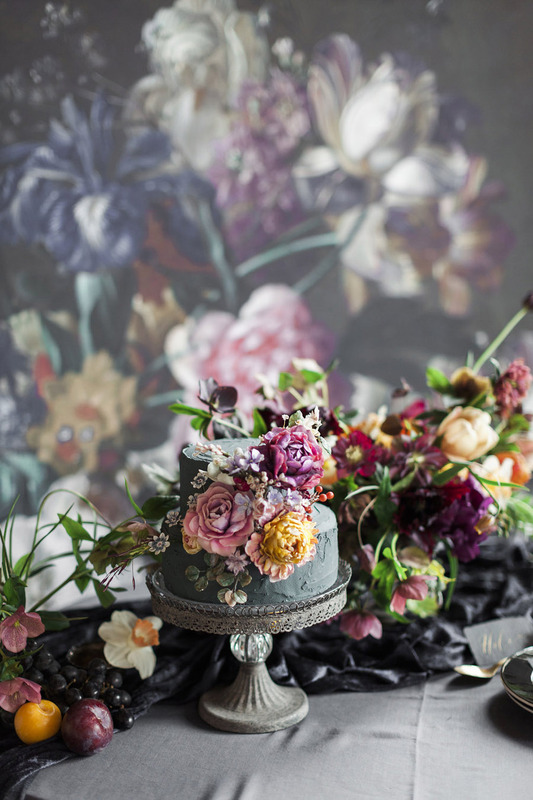 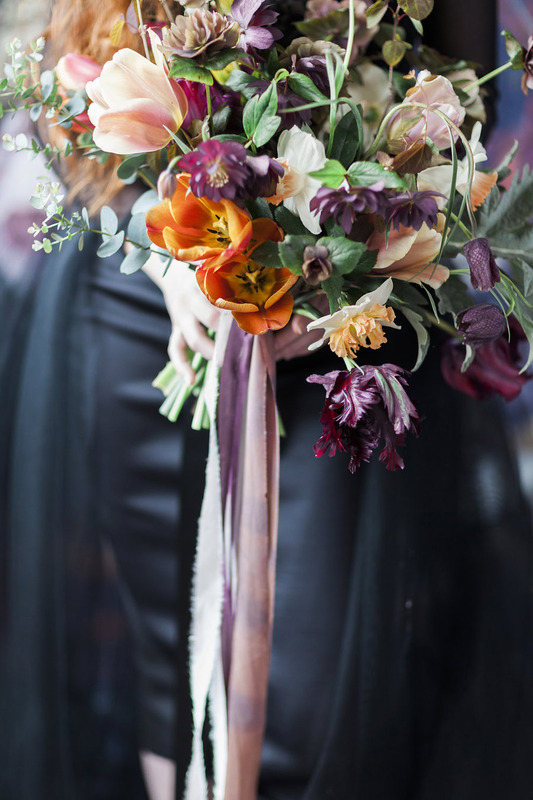 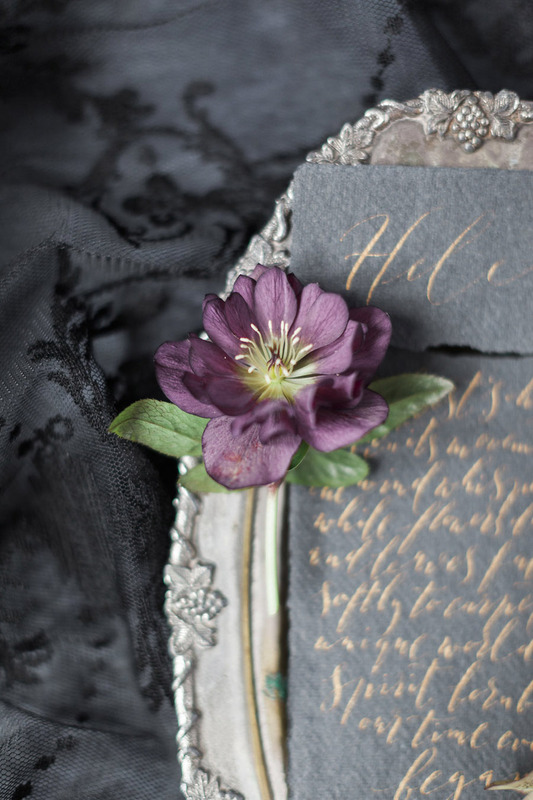 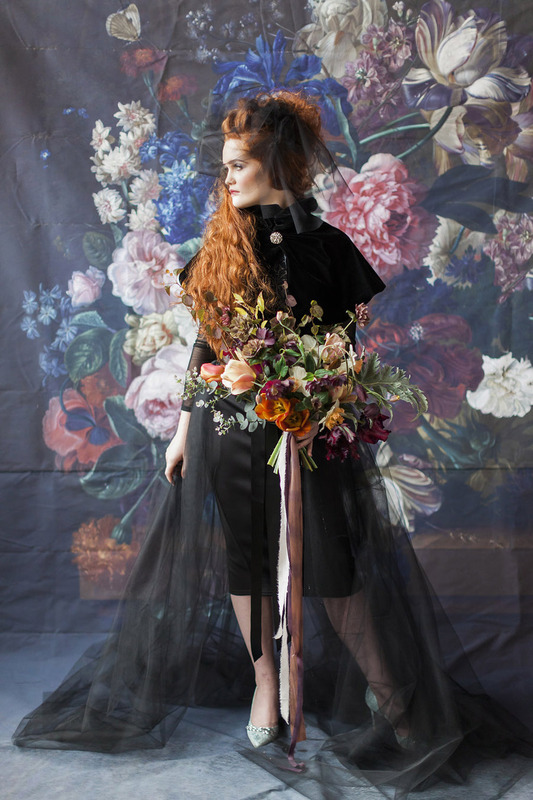 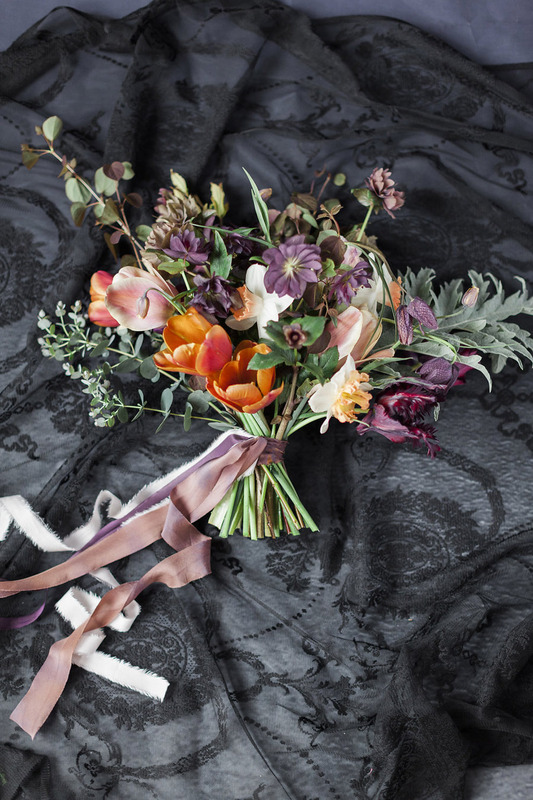 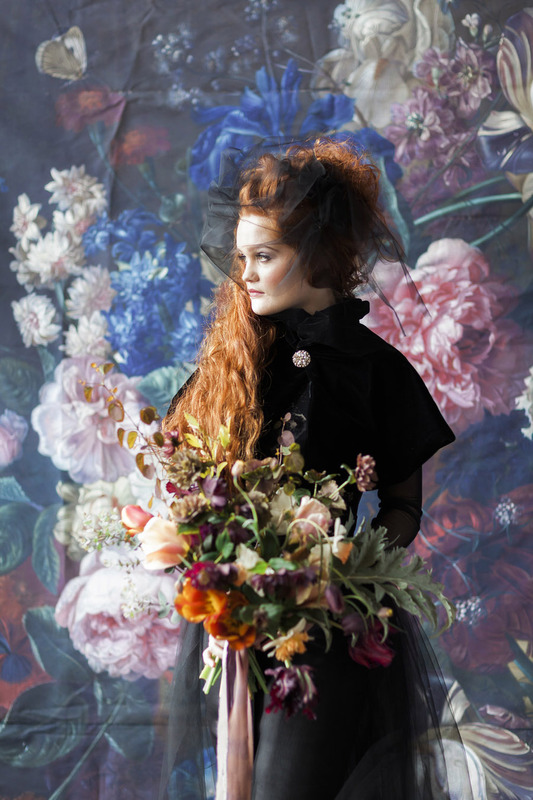 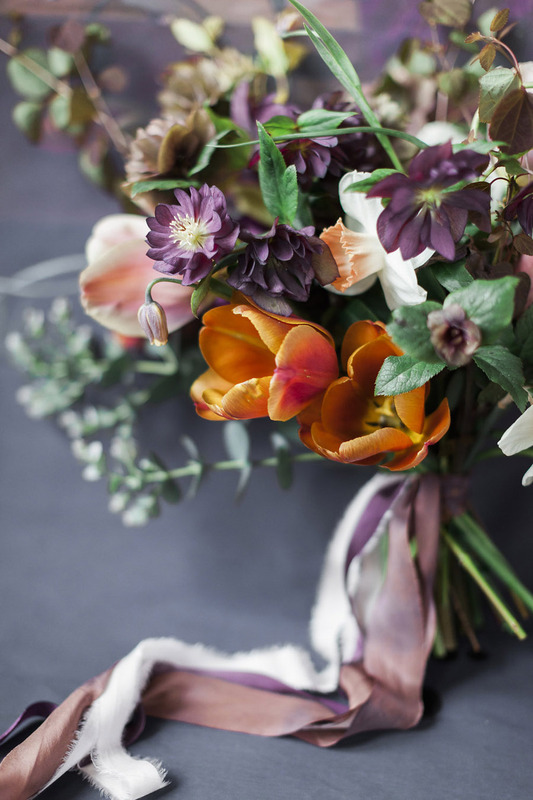 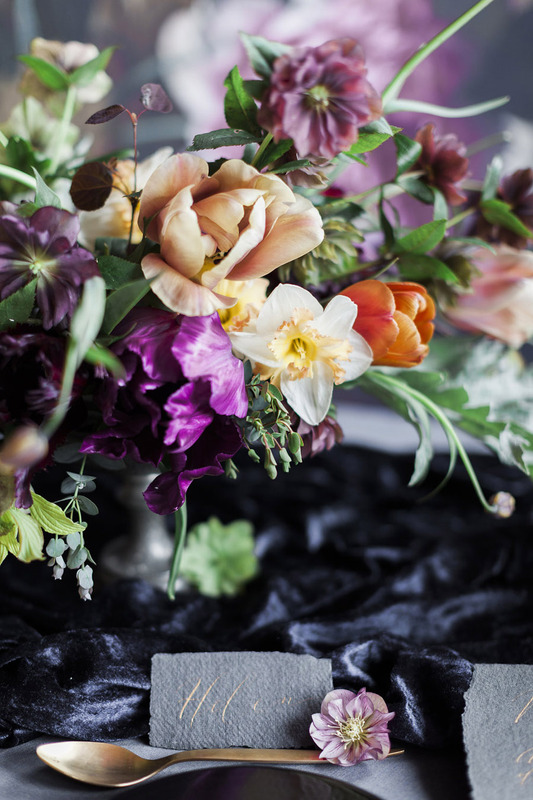 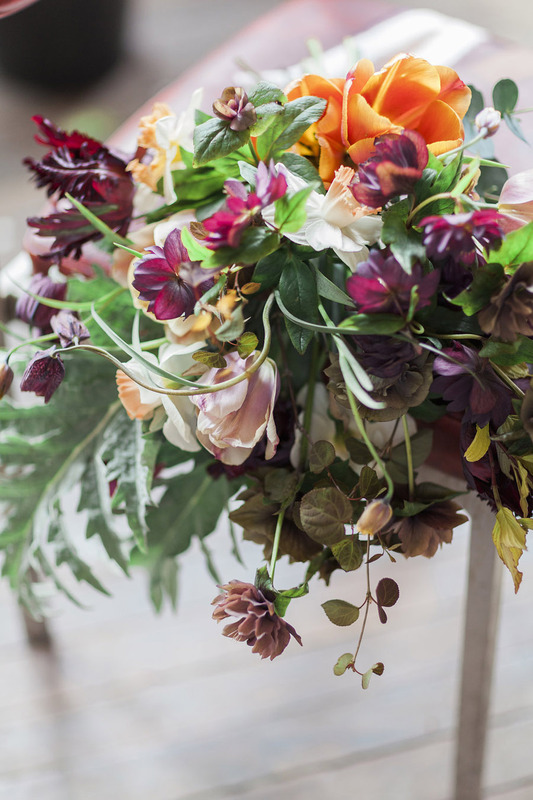 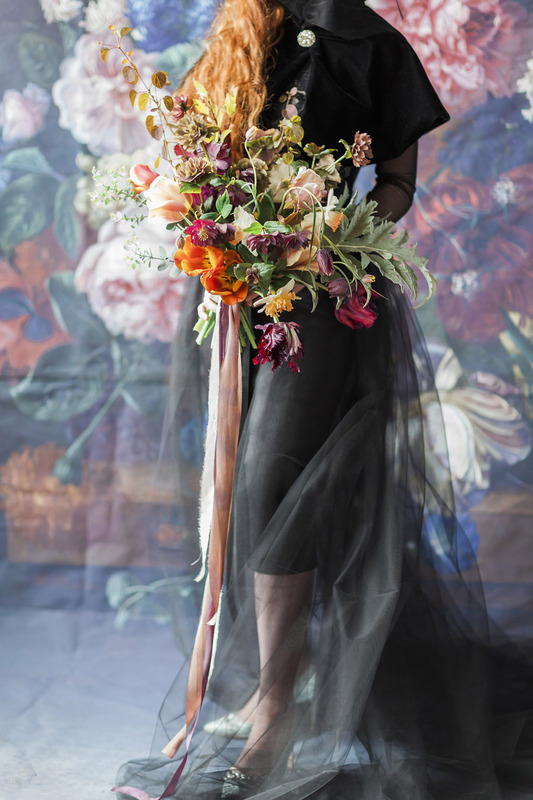 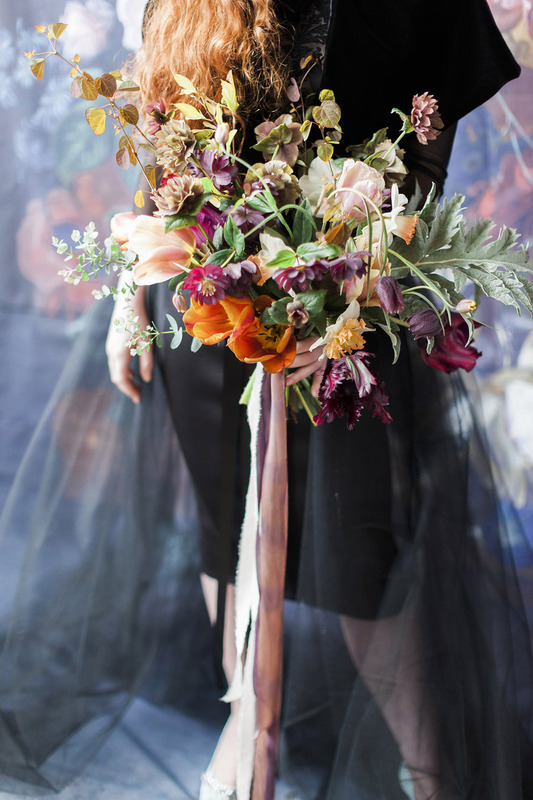 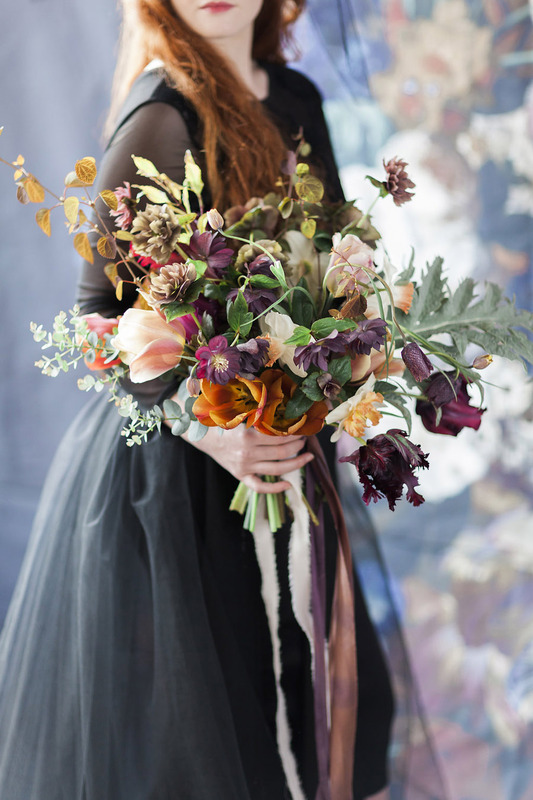 The flowers, designed by Joanne at Fletcher & Foley and grown by Carol Siddorn, combine dark, dramatic shades with vibrant pops of colour. 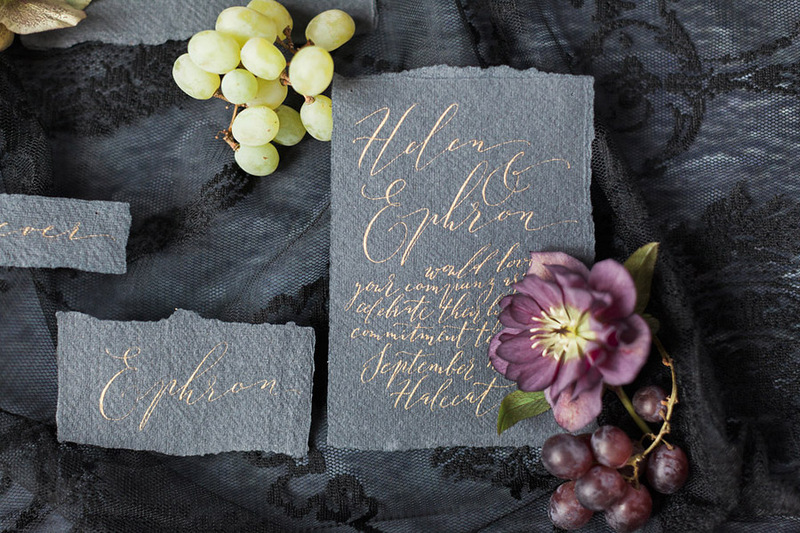 The textures are soft and beautiful, the shapes are simply divine. 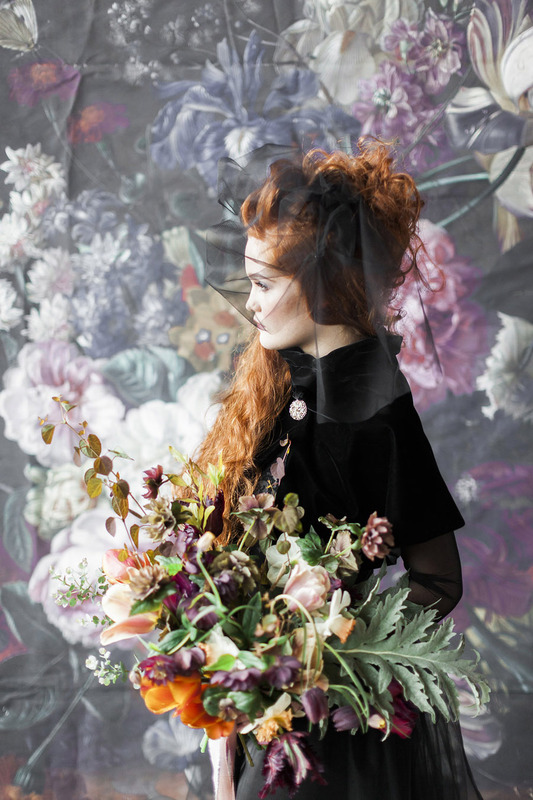 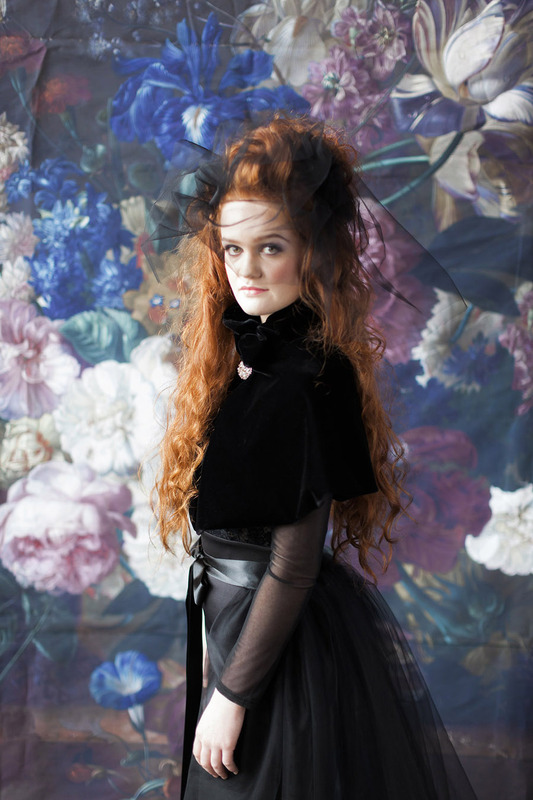 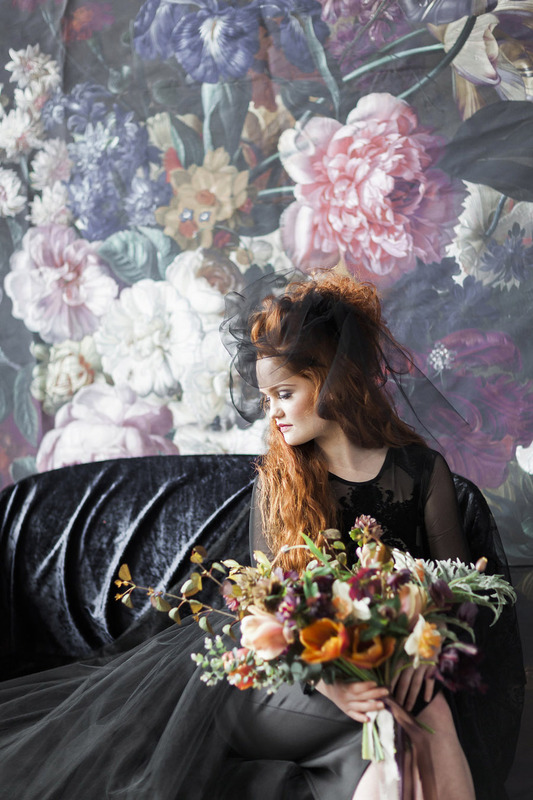 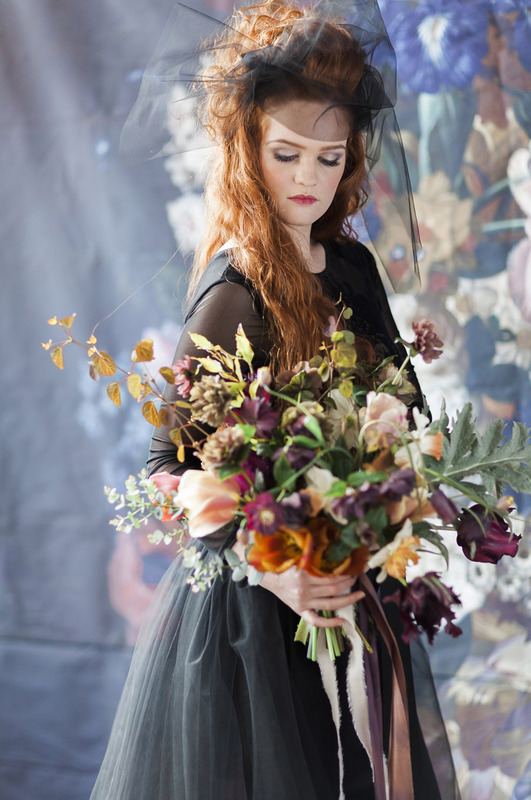 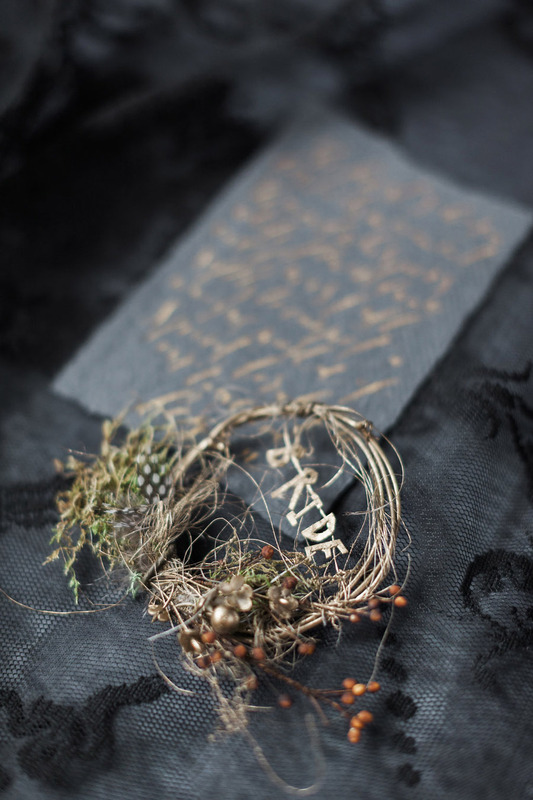 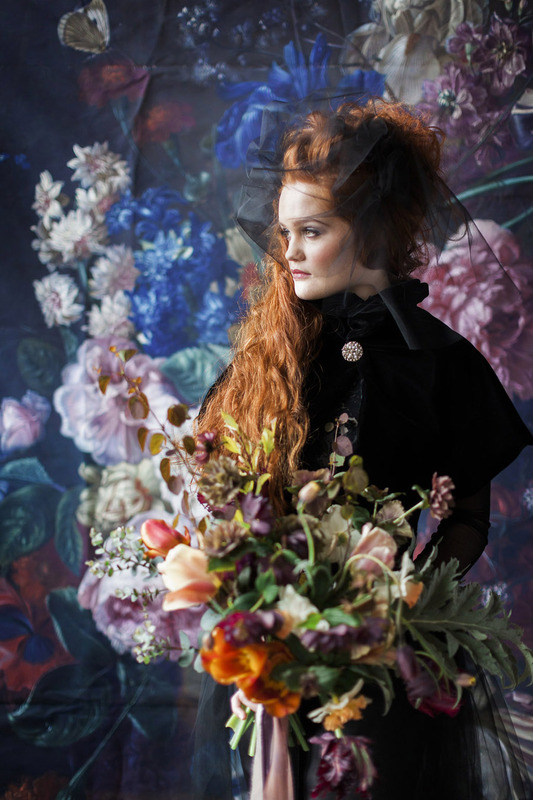 Every detail of this shoot is just wonderful – the black wedding dress by Village Bride is as perfectly alternative as can be; bride Olivia is stunning with hair and makeup by Amanda Jones and a flower crown, again beautifully handcrafted by Amy Swann. 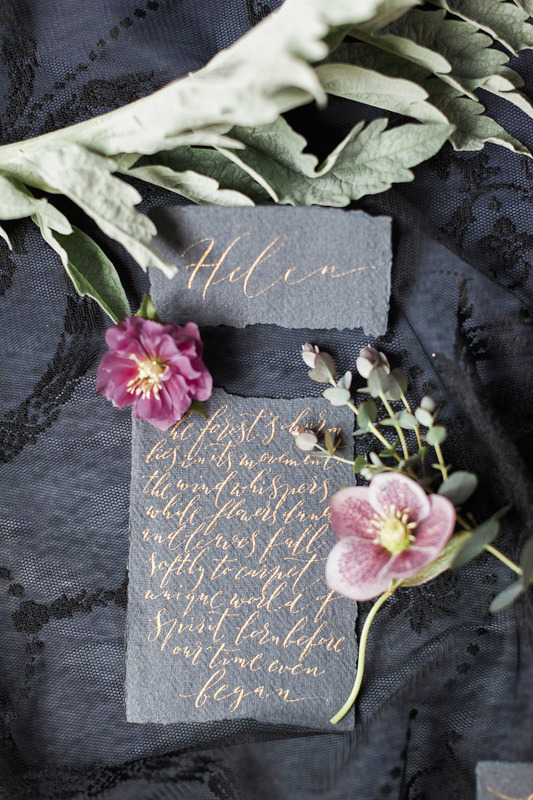 The stationery is handwritten – this is what I do when I’m not writing the English Wedding Blog. 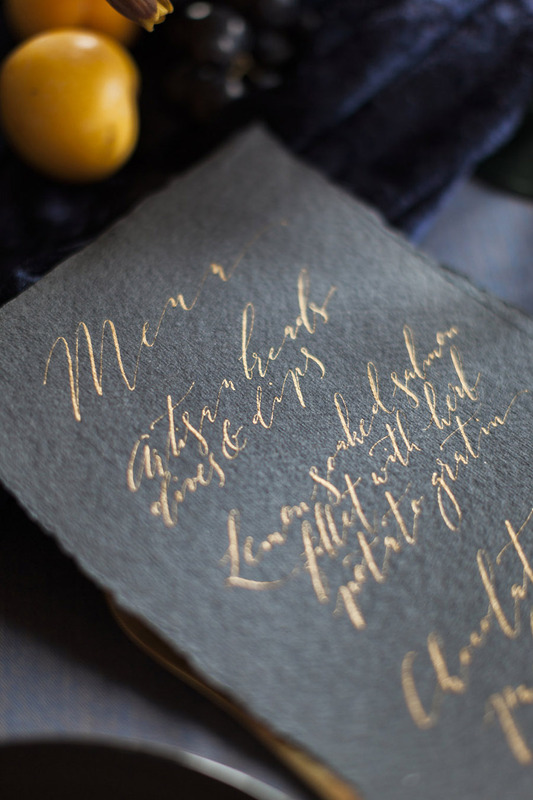 I used textured black paper and mixed a soft metallic gold ink, which creates a gentle shine and raised effect on the paper. 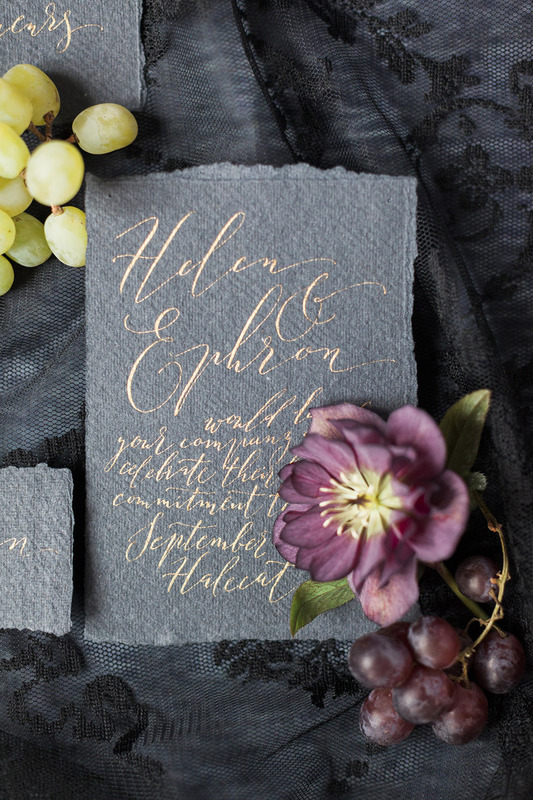 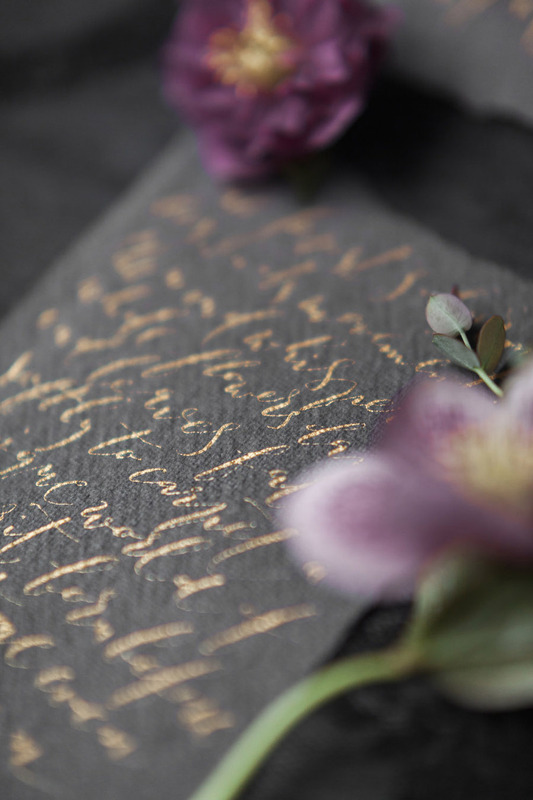 I love designing wedding stationery suites which have more than the simple invite + envelope combo, so we included a handwritten quote, a bespoke calligraphy menu and some little place cards too. 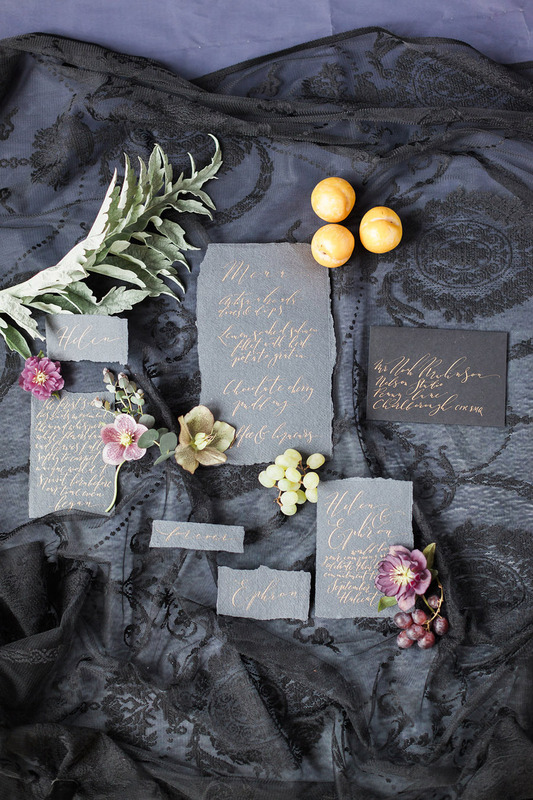 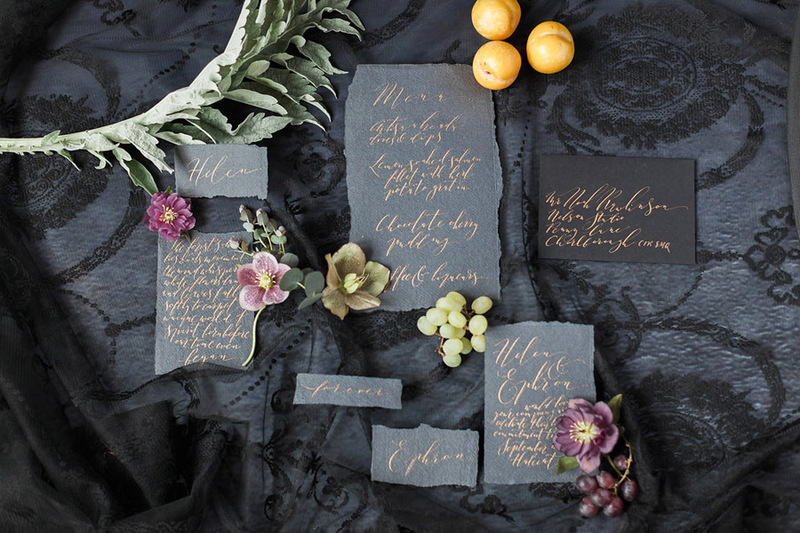 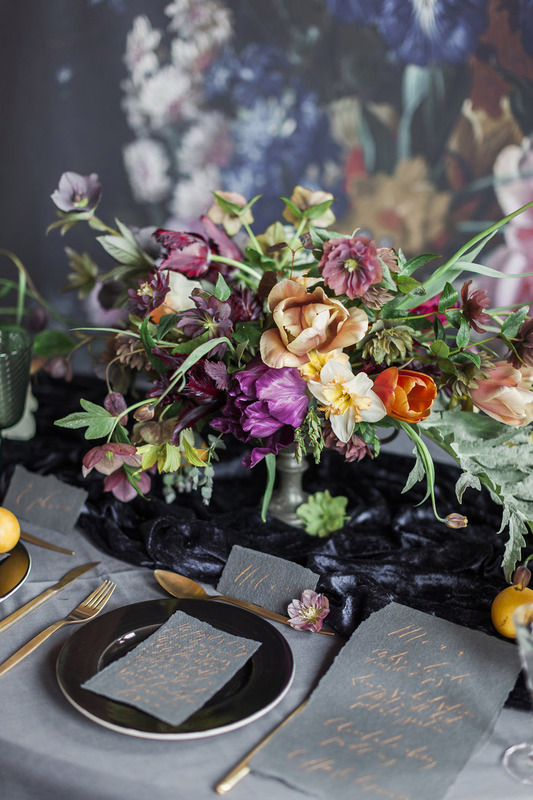 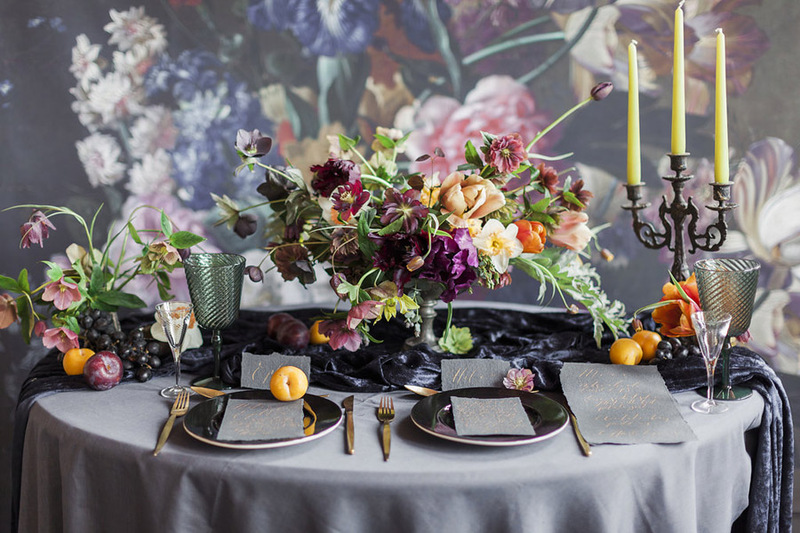 The lettering is a very modern, slanting script which evokes the drama of the shoot and ties in perfectly with the floral elements and table styling. 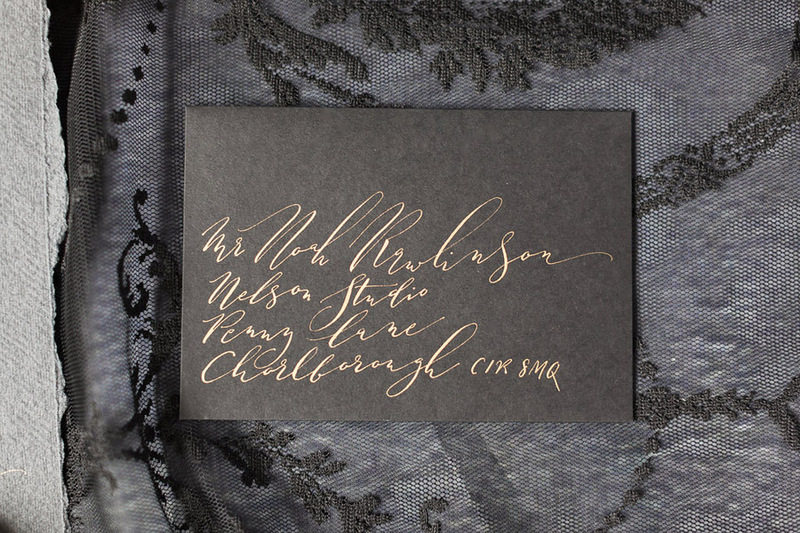 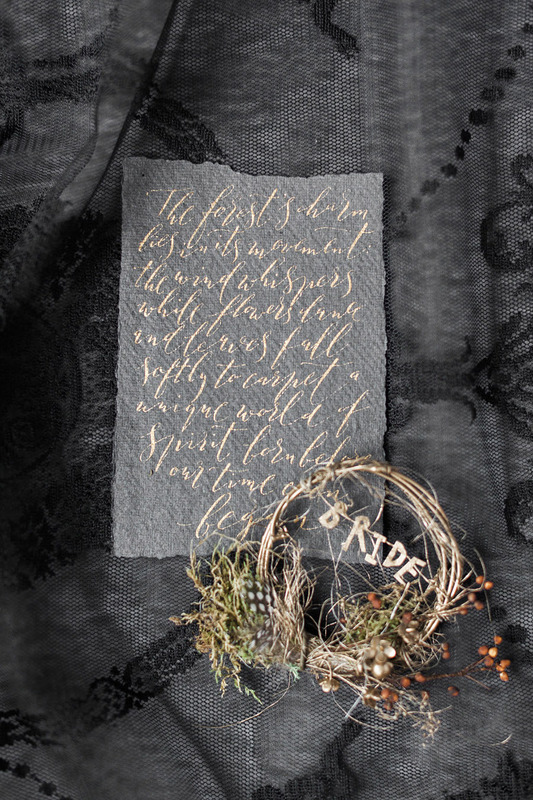 See more of my calligraphy at Calligraphy-for-Weddings.com. 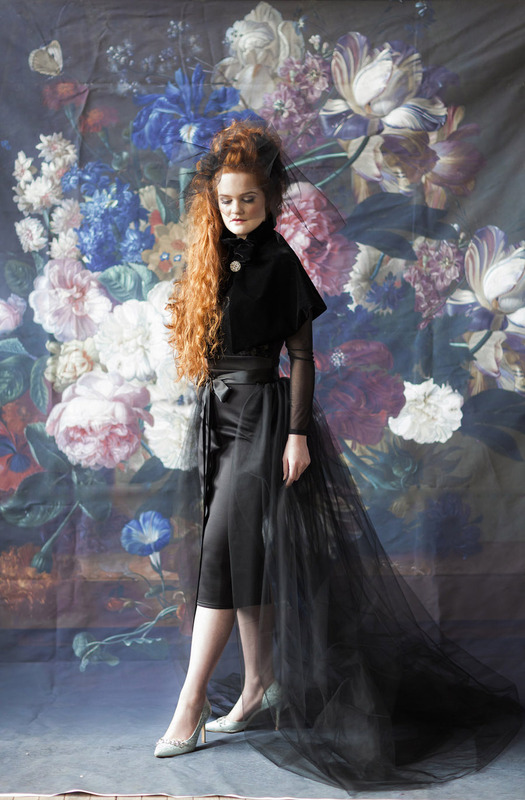 The shoot took place at Stretford Public Hall. 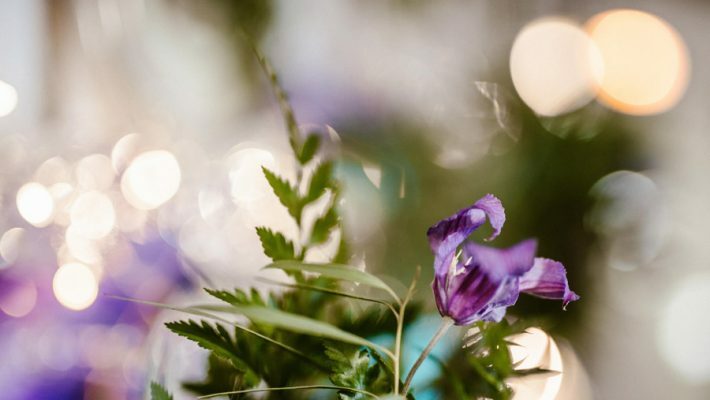 Vibrant, alternative peacock inspired barn wedding ideas – in pictures!